Earlier this month, I received a Way Tek Mk06. The overall rarity of the keyboard amalgamated with the very little documentation available on the Internet convinced me to buy a model and try to make it work on my own computer via USB. I finally managed to get it functional, and as a matter of fact, I am writing this article with the keyboard! This is what I did to set up my Wey Tek Mk06 to my computer. Your process might be different depending on your type of Connector Box and firmware version. I don't currently know how to upgrade or otherwise downgrade the firmware and how other connector boxes work. 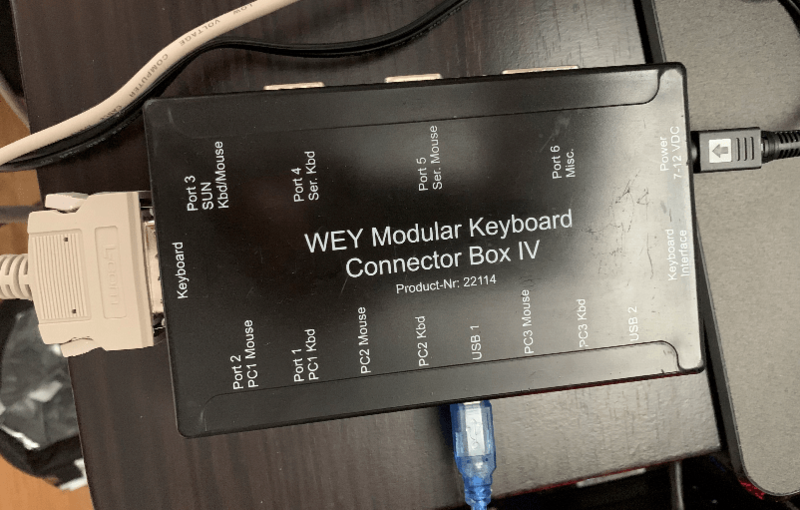 My current firmware version is 1.26 and i have a Connector Box Model IV. Connector Box Model IV, with its power supply. Press the tiny red button on the back of your keyboard to reset it to its default settings. Plug the USB 2.0 cable into your Connector Box's USB 1 port and into your computer. Arrived at the splash screen, press the CTRL + ALT + Logoff/System buttons simultaneously. 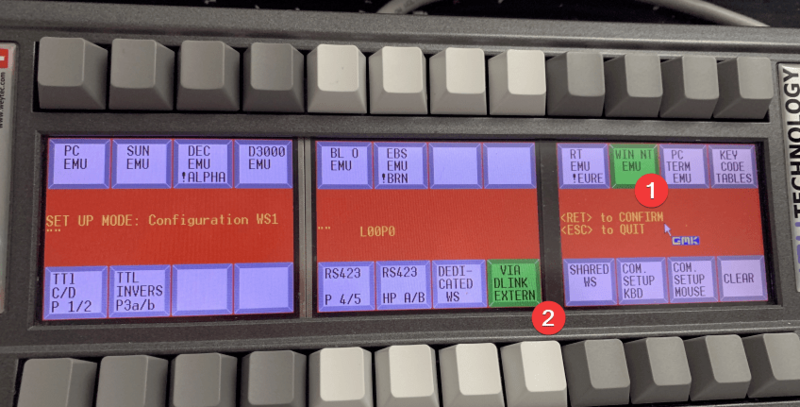 You should land on red configuration screen. Navigating the configuration screen is done using the buttons above and below the screen, along with ESC/RETURN to return and save options. Enter CONFIG WS 1. Toggle WIN NT EMU and enter VIA DLINK EXTERN. Press CLEAR ALL ADDR, press USB1 30 (if the option is yellow, press ENTER) and then press EXIT WITH SAVE. Press ENTER and then ESC until the keyboard reboots. Arrived at the splash screen, press the WS1 button next to ESC. Ta-da! Your keyboard should be functional and usable with a modern computer! You can toggle it off at any time by simply pressing WS1. If you have more than a single USB-A to USB-B cable, you could set up a second computer by following the same steps but going into WS2 instead of WS1. Neat, uh? If you have any questions, you can ask them here and I'll try to answer them. Cheers! Hey, I am a newbie.